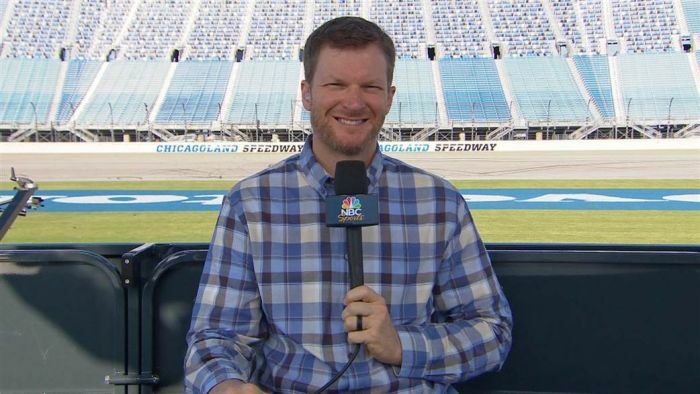 Dale Earnhardt Jr. is following some of the other racing legends into a new kind of “hot seat”. Junior is working as a racing analyst and broadcaster for NBC Sports. Earnhardt updated his fans on Twitter about his debut week-end at the Chicagoland Speedway covering the NASCAR races.. In the video, Junior admits that he is nervous about his new job, and appreciates being able to do the two practice sessions this week-end so that he can be less nervous for his first big race in the broadcast booth on Sunday. In the video, Junior says he is “pretty excited” about the new job but cautions that he “has a lot to learn” from his new broadcast teammates, Rick Allen, Steve Letarte and Jeff Burton. Junior says he “is so glad that NBC is allowing us to wear casual clothes” during their broadcasts. Earnhardt also promises fans that at some point during the race season, fans will get to choose what the broadcasters have to wear, which should make the show a little more fun! NBC has not detailed exactly what Earnhardt’s role will be during the shows, other than he will be reacting to what is happening on the track and offering some insight into what drivers may be facing during the grueling races. It is no secret that NASCAR is struggling to keep fans coming to the tracks and watching the televised races. Organizers have changed the race formats to try and make the sport more interesting for some fans, but the changes have also driven some long-time fans away. Earnhardt has been voted the most-popular race car driver 15 different times. Earnhardt retired with 26 wins in the Cup Series, a total which put him in the top 40 in NASCAR history. He has won the Daytona 500 twice. Clearly NBC is hoping that his analysis and color commentary can draw fans back to the sport. Earnhardt is the son of another wildly popular driver, legendary Dale Earnhardt Sr. Earnhardt Sr. was killed in a crash during the Daytona 500, on February 18th, 2001. Junior announced that he was giving up driving because of the effects of too many crashes, concussions and other injuries, were taking a toll on his health. He joked that the others are able to interact with the producers and ask to talk about different subjects while he is just learning. Dale Jr. visited the booth as a guest in previous years, and has made some appearances for NBC during the Super Bowl, Olympics and Stanley Cup Finals. The Overton’s 400 is scheduled to start at 2:30 p.m. ET on Sunday, July 1st, as Dale Earnhardt Jr. makes his professional broadcasting debut. The green flag will wave and signal Junior’s new journey, in Chicago, as NASCAR coverage shifts from FOX to NBC.